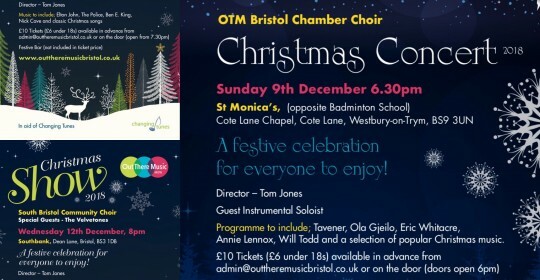 Out There Music Bristol | OTMB Christmas 2018 Here We Come! It’s a busy time of year for Out There Music Bristol right now, as we gear up for an eventful festive period. It all starts this Saturday 8th December when the North Bristol Community Choir will be performing at the OTM North Bristol Christmas Show at The Elmgrove Centre in Redland. Opening the show will be special guests, The Velvetones, a fantastic vocal trio singing a range of popular, jazz and Christmas treats! Then the North Bristol Community Choir will take to the stage to perform songs we’ve been working on from this term including ‘Into My Arms’ by Nick Cave, Elton John’s classic ‘Tiny Dancer, a mash up of ‘Stand By Me’ and ‘Every Breath You Take’ as well as some Christmas favourites. As always at the Christmas community choir shows, the audience will be sat at tables Cabaret style with a festive bar to accompany the music, so it promises to be a fantastic evening all round. The day after on Sunday 9th, it’s the turn of the Chamber Choir in the beautiful surrounds and acoustic of St. Augustine’s Chapel at St. Monica’s off The Downs. A more formal but equally rewarding experience awaits including music by Tavener, Eric Whitacre, Ola Gjeilo and Annie Lennox as well as some beautiful Christmas music. Following on from that and completing our trilogy of Christmas performances, the South Bristol Community Choir will be performing at the Southbank on Dean Lane in Bedminster on Wednesday 12th December at 8pm. It’s the same programme as the North Bristol show with The Velvetones opening once more, but it will not be the same experience as it’s in a contrasting venue from a choir with a different character and sound (both choirs are equally great I might add!) At the Southbank show you also have the added bonus of the choir and audience Christmas singalong which is always a lot of fun! Tickets for all the shows are just £10 each (£6 under 18s) and available from admin@outtheremusicbristol.co.uk or on the door. Just check our concert page for exact details of times and dates. And remember, we’re always looking to recruit new members so if you want to get involved in any of the groups, please contact us at admin@outtheremusicbristol.co.uk or just come along to one of our rehearsals. To see where and when each group rehearses just click here. And remember, you can check out videos of all our latest performances at our YouTube channel and on our Facebook page. All the OTM Bristol groups have been sounding fantastic this term – even by their own high standards! – so I would recommend coming along to at least one of the shows!